In my prior posting, "7 iPad Apps I like..." I note that there is a big difference between apps that I select and use for my Android phone versus the apps that I select and use for my iPad. 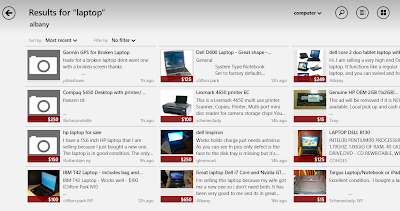 In particular apps that are based upon delivering features of an established website, such as ebay, Craig's List, your financial institution, etc must offer more than can be gleaned from the base site. If the base site is great, then the compulsory question for any app is "What is the value added?" On the small screen of a smart phone, the answer is often that the app delivers the content in a manner that is usable on the smaller screen. However, for the iPad, screen size is not such a big issue, so the "value added" for an iPad app must be something other than to adjust the features of a site to the screen size of the device. 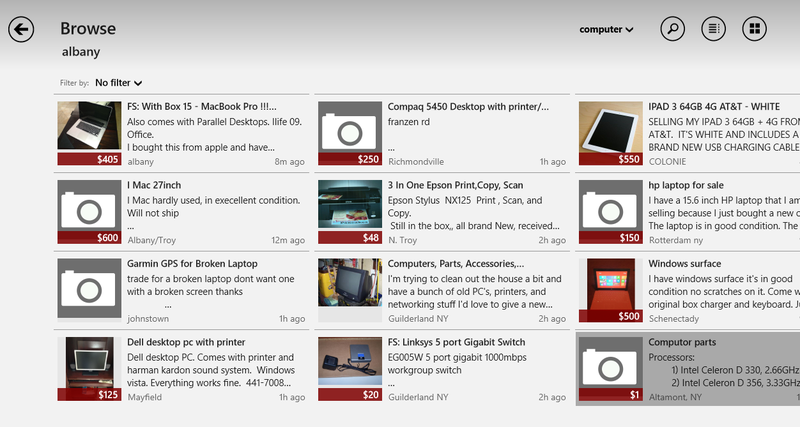 I have also discussed Windows 8 in a couple of prior postings. As many know by now, Windows 8 heralds Microsoft's maiden voyage into moving their dominant operating system into the world of touch screens and apps. Like the iPad, apps for Windows 8 on a laptop must be prepared to deliver more than a "resizing" function for users such as myself to adopt them. 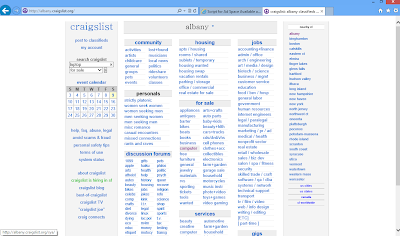 For this posting, I selected one of my favorite sites, Craigslist, and will compare the user experience of the site itself to the Windows 8 Craigslist+ app. 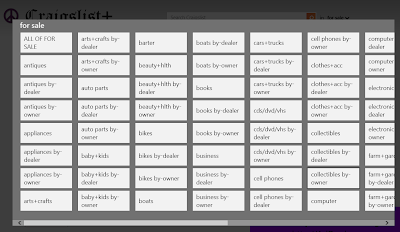 Now, I turn to the Windows 8 Craigslist+ app where I begin by clicking the Craigslist+ tile. (So far so good). 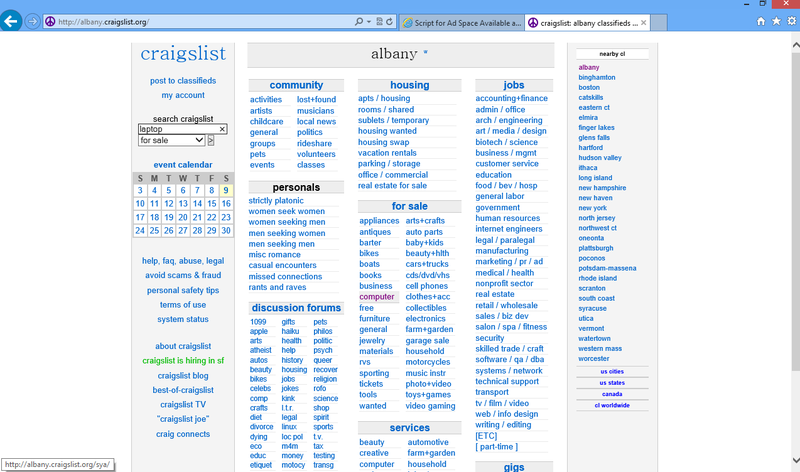 Please note that I looked at 3 different Windows 8 Craigslist apps and I thought that the Windows 8 Craigslist+ app was the best of the 3. 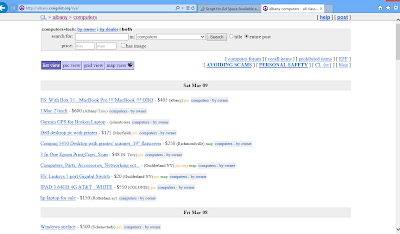 Next, you are presented with the Craigslist+ search screen shown below. While I find this a bit clunky, it's not too bad... yet. (Although, I note the advertising in the lower left corner that comes as the price of this "free" app). From here, I need to click the search button (magnifying glass) in the upper right hand corner (above) of the window which brings up the Windows 8 search screen (below) for me to enter "laptop". 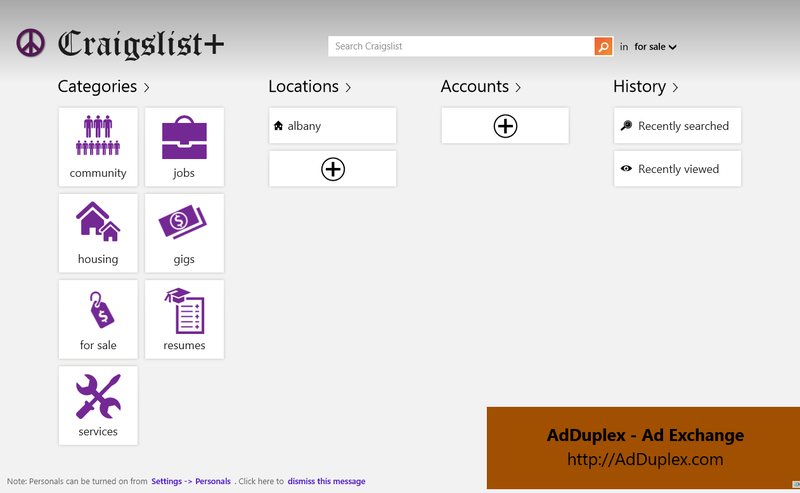 While this presentation may arguably look better than the list presentation yielded by going directly to Craigslist, I count about 4 additional clicks that are needed when using Craigslist+ app. 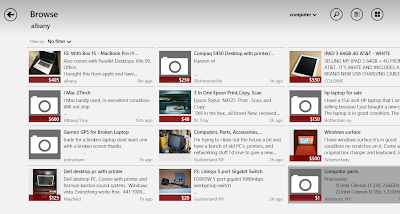 Conclusion: This app is just too clunky. 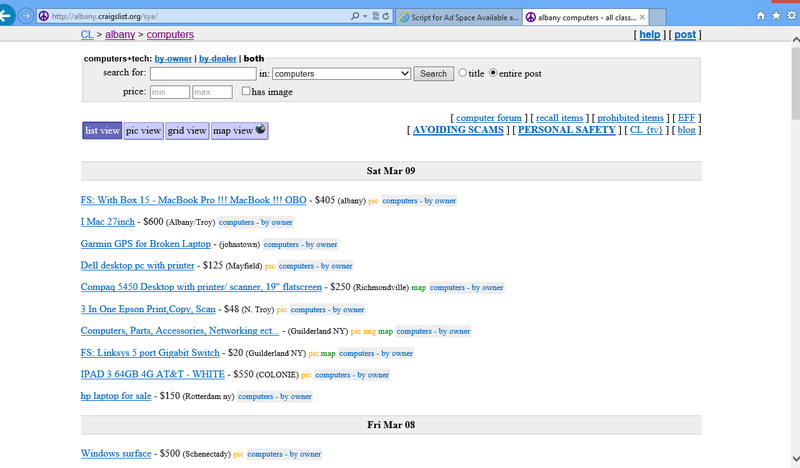 Instead of adding value to a Craigslist search, I find that its cumbersomeness actually diminishes value. Why would anyone put themselves through using this app when it is much simpler and quicker to go directly to the site? 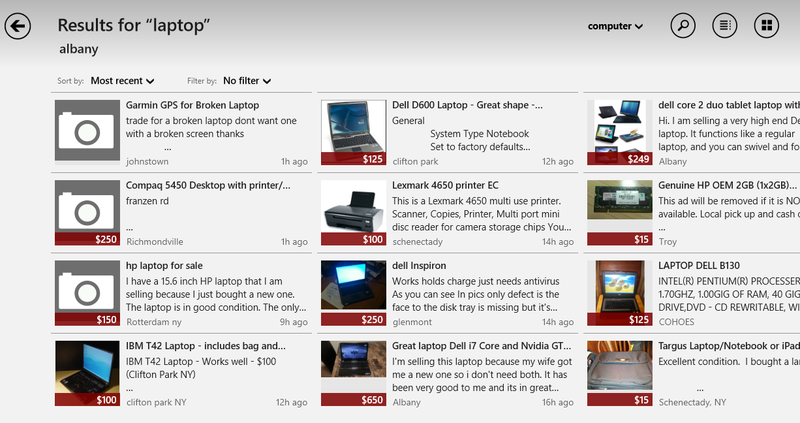 Sadly, I must report that this has been my typical experience thus far with Windows 8 apps on a laptop. Some experiences have been even worse with apps "crashing" by either freezing or closing unexpectedly. I will note that my experience has been strictly using free apps from the Microsoft store. Perhaps, paid apps might fare better, but if Microsoft follows a model similar to Apple, paid apps are likely to be "advertisement free" versions of the free app and thus, would not reflect any meaningful difference in performance or basic structure. 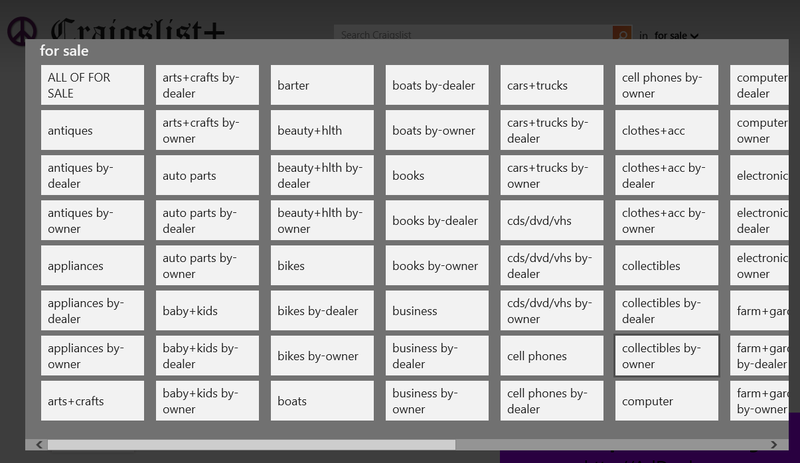 My lackluster experience with the Windows 8 free apps does not encourage me to gamble money to pay for the abuse.